I’ve never understood dating websites. What do you like? What are you looking for in a mate? Do you prefer beaches or forests? Boxers or briefs? Online dating profiles are where meaningless chitchat and overweening, new age nonsense collide in an epic explosion of boring, self-important crap. You wanna get to know a person, you gotta ask them something real, something personal. If I really want to know a person—and I usually don’t—I ask what kind of soup they would be. Are they a creamy, fishy clam chowder kind of guy or gal? Or a smooth but rich lobster bisque? A conventional, homey chicken noodle soup? Me, I’m a stew kinda guygal. The great thing about stew is that you can throw a bunch of crappy odds and ends in a pot and the result is so much greater than the sum of its parts that you’d never guess you were eating chicken feet and mice droppings. 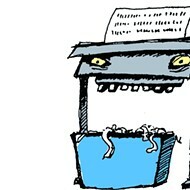 This weeks’ column is going to be a bit of a Shredder stew. Our first ingredient is a YouTube video posted on Oct. 29, 2012, depicting the San Luis Obispo City Council, specifically Mayor Jan Marx and Councilman John Ashbaugh, trying to help buddy Peg Pinard block a crosswalk warning device for the blind from being installed at her intersection. So apparently Pinard’s got a history of lodging self-entitled demands with her buddies at the City Council. What’s more disturbing is that the City Council has a habit of disregarding the public good—those crosswalk buzzers might be annoying, but they exist for a reason, which happens to be helping blind people avoid getting hit by cars—and catering to Pinard’s demands. In this case, former councilman Andrew Carter put the kibosh on the attempt by pointing out that those buzzers were part of an effort to comply with ADA regulations. Marx and Ashbaugh expressed frustration with this sentiment, because apparently appeasing a demanding friend is more important than ensuring the safety of blind people. When the City Council was once more recently asked about one of Pinard’s special requests, this time in the form of a piece of public art she didn’t like and therefore wanted removed, most of the councilmembers involved took the time to answer a reporter’s questions about the incident. In response to a series of eight questions—among them whether Pinard was the only person to complain about the artwork, concerns about censorship and the type of precedent such behavior would set, and whether the smoking Marx strenuously objected to did, in fact, refer to a piece of artwork that didn’t seem to feature any smoking—Marx simply responded that much of that information would be available in July when the artwork was placed on a City Council agenda. Our second ingredient is another City Council—this one representing Pismo Beach—that recently voted to introduce an ordinance that would ban mobile medical marijuana dispensaries as part of the city’s noble struggle against REEFER MADNESS!!! The council even acknowledged that the effort contradicted the will of California’s voters as expressed in the 1996 Compassionate Use Act, but ultimately concluded that federal regulations were more important, which I think is totally justified because it’s not like Pismo Beach licenses businesses that sell alcohol—which is essentially a legal drug—or doctors who prescribe pharmaceuticals that will have you seeing little green men and ranting at inanimate objects. And our third and final ingredient—unless I happen to come across a pack of bologna or vial of absinthe in the next few minutes—is a thread posted on Yo Banana Boy!’s Facebook feed. In case you were wondering, as I was, Yo Banana Boy! is neither a white rapper nor a delicious frozen ice cream treat, but a Pismo Beach business that provides water, food, and gear to riders out on the dunes. But perhaps the very classiest of all was Chris Mullally, who threatened, “Maybe if they close the dunes we can join a gang as a new hobby and terrorize the town for fun instead.” In other words, if Chris Mullally doesn’t get to take his toy car out onto the sand and drive it around, he’s going to tear up Pismo Beach. (I hear ISIS boasts similar origins.) Now I don’t know what the city’s policy is on negotiating with terrorists; if it’s anything like the city’s proposed policy on mobile marijuana dispensaries, it’s reactionary, alarmist, and completely unreasonable. But on the other hand, Mullally’s gang might just give the Pismo Beach Police Department an excuse to bust out some of those tanks they bought off the military. I’m not sure if Yo Banana Boy! is willing to sponsor the gang, though I’m sure if they do their colors will be yellow and they’ll take a page out of Mario’s book and throw banana peels at unsuspecting police tanks, which will spin out while making hilarious cartoon sound effects. I guess I’m just going to have to throw some bananas in this stew, too, and hope the combination of nepotism, hypocrisy, stupidity, and bullying makes for a good-tasting Shred. 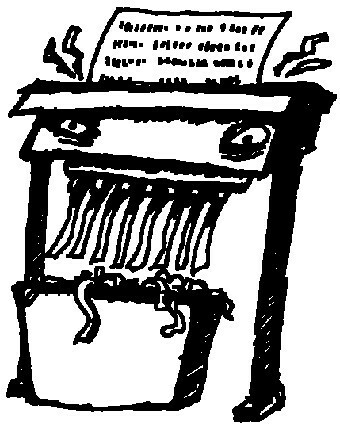 Send your stew recipes to shredder@newtimesslo.com.